If your vacation on the Adriatic is ruined by rainy days, Adriatic.hr will compensate for the damage. We will refund you as much as 50% - 100% of the amount paid for private accommodation, for the adequate number of rainy days. You just have to pay for the insurance when booking accommodation (money refund amount depends on the insurance payment amount) and send a filled confirmation stating that the weather conditions disabled you from spending quality day of your vacation, e. g. that there has been a rainy day (or several of them). In case that guests are surprised by rainy days during their vacation, Adriatic.hr guarantees money refund, under condition that the guests have paid for insurance in case of rainy days. Rainy day is defined as a day during which there has been constant rain from 10 am till 6 pm, which disabled the guest from spending a quality day on vacation. 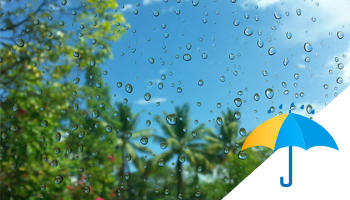 Rainy days refund is compensated in a form of a discount on private accommodation booking for the next season. If guest does not use the discount during next season, he/she is no longer entitled to it. Insurance can be paid for private accommodation bookings in Croatia only and it cannot be paid retrospectively. Insurance cannot be paid if guests book private accommodation, and the arrival is within next 8 days. Insurance cannot be paid for Lika region. To get refund based on paid insurance, guest has to present Adriatic.hr with a written confirmation. Confirmation has to be given by the facility owner or nearest tourist board (when the guest is situated in the house where there is no facility owner). With this confirmation, the owner or the tourist board give evidence that the day specified was a rainy day (according to the above stated definition of a rainy day). The guest must deliver the confirmation to the Agency by fax, email or MMS (MMS content has to be a photography of the confirmation), no later than noon of the following day, in order for the Agency to verify the stated. If there are several rainy days in a row, the confirmation is sent for all days at once, by noon of the day following the last rainy day.